Tuck point is hard work. More please. If you have a house with brick, stone, stucco or masonry construction, it’s likely you’ll learn about tuck point, crowns, or scratch coat mortar, among other things, at some point in your home ownership. Brick, block and stone are constructed by craftsmen who are good with plumb and level, have excellent math skills and can’t deny their artistic streak. This type of construction is artful, long lasting and often reflects the style of the original constructor. Maintenance and repair of these house components are as basic as window well walls or as challenging as the highest chimney feature. I don’t climb a lot, so chimneys over about fourteen feet are not mine to do. And I never do the inside flue work on a chimney. Same with high exterior walls. But foundation walls, window wells, porch pillars and landscape walls, I’ll do these things anytime. A lot of this work is basically art. Hard, messy, heavy art. For the last few weeks I’ve done tuck point out doors. It’s fall in this region and the weather and plants are changing. There’s more mice and beetles in the basements. The light starts to fall off to the edge of the sky, and since exterior mortar work is subject to freezing, the tiny place in my brain holding the most ancient lessons says it’s time to hustle. Not so many more weeks before mortar is done outdoors this year. The first job last month was two walls facing a behind the house garage off a shared driveway. The walls were likely original to the house, that made them somewhere near a hundred years old. They had been tuck pointed off and on over the decades, and they were due for another round. Vines were draping over the walls but not climbing them. If you have climbing vines on your house and trees, stop that. Vines eat houses and trees. It looks pretty, like a cottage in the woods or a house in old world such and such. Vines ate those houses too. Anyway, Cutting away the vines and growth showed both walls fully, they had about three or four inches of exposure facing the soil behind and stood about five feet at the tallest end. Both the loose ends out in the yard had fallen to rubble. Using a light power washer and electric chisel I cleared the mortar joints, washed away soil and debris and prepped the wall for mortar replacement. Almost one hundred percent of the viewable exposure would be tuck pointed. The rubble ends of the walls were re-stacked and set in mortar. The tuck point was installed on the face toward the driveway and the back face toward the soil. I use an electric concrete mixer for these jobs, it keeps the mortar moving, allows a near perfect mix to continue throughout the day and saves a ton of time compared to hand mixing. The tops of the walls had been tucked in the past but never crowned. The customer preferred the natural look of leaving off the crowns. Because of the rubble wash outs, and the condition of the walls, a lot of space was left in the hollow part of the wall. 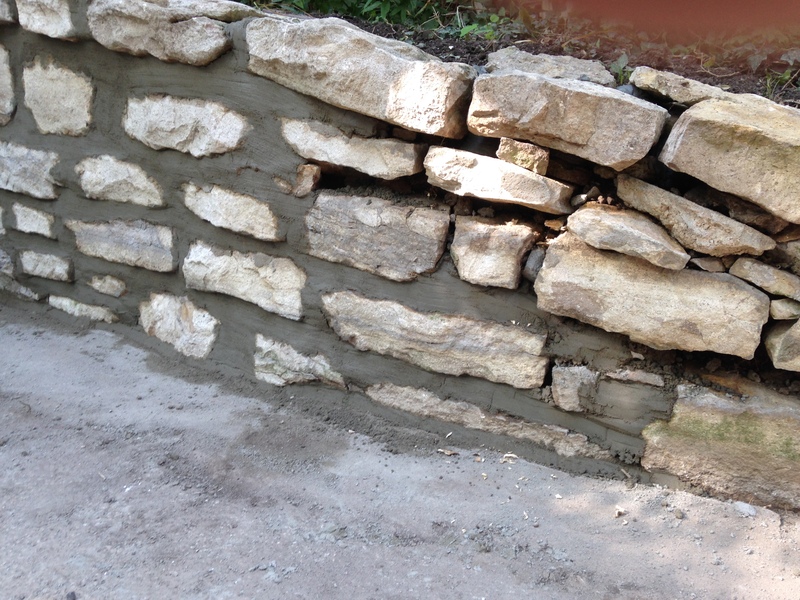 Since the front and back were freshly tuck pointed, I mixed several batches of pourable mortar and filled the wall through the gaps in the unfinished top of the wall. 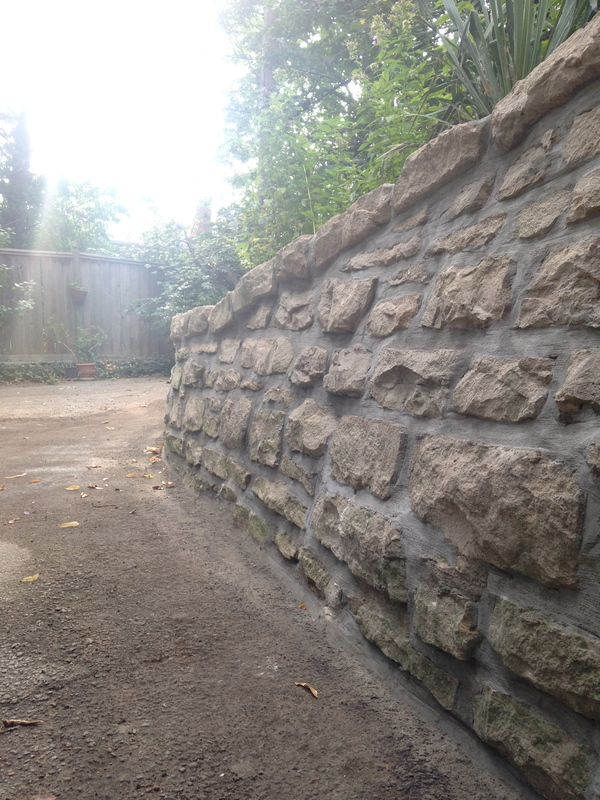 These gaps were tuck pointed back to appearance and the wall turned out to be very solid. To finish things off I drilled a series of drain holes along the lower part of both the walls to let water through. All in all the repair was completely appropriate. The walls will last a lot of years before they need much attention. 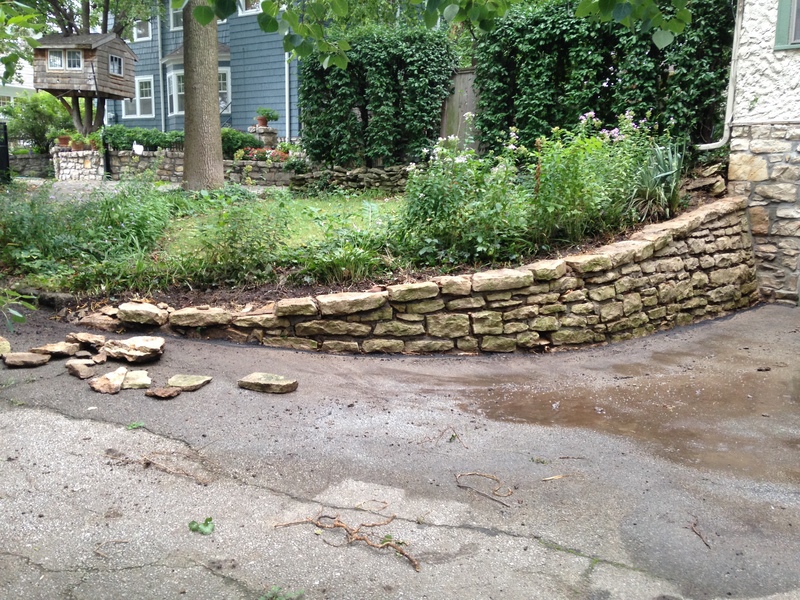 The cost was considerably less than a new engineered wall and the value of preserving the antique wall behind the antique house is undeniable. Preservation. Heavy preservation. The home owner of this house hired me about six years ago to improve the kitchen in the house. I’ve worked my way all over this house. Kitchen, bathroom, living room, exterior repairs and lots of tuck point. I love this house. The owner and her family have had a habit of preserving history, through their house, public work and living standards, for a long time. The dog knows me and expects attention. The last dog who lived there made such and impression on me I built him into an online parts house password, “jackbarks”. When I get there in the morning I get a cup of coffee, grab some sugar from the cabinet and put the spoon back where it goes. My customer wants to know how the kids are and if my truck is fixed. At the end of the day I drink a beer from the basement fridge. During the week I line my caps up on the work bench in the basement, just so we all know how much I love that beer. If there’s no beer downstairs, there’s more on the top, left, shelf in the kitchen fridge. Those caps to in the trash. Get it? This is how to have a house. How to work on a house because you love the house so much the house loves you back. This house will get more work. This winter I’m going to paint a first floor bedroom and wood work. I’ll do my thing, make the plaster just right, good primer and paint and of course polish out all the hardware. Next spring I’m going to tuck point the exterior foundation wall and three window wells on the south side of the house. The air will be warming up, all the way through the night. The sun will tip back up overhead. Knowing there’s only so many days in a summer, that tiny part of my brain will have me hustle the tuck point again, love the house and pet the dog. Love this wonderful account of the changing seasons and the ever changing house. Thanks for a great read. Basically the act of filling the void between stones, bricks or blocks with Mortar. Send me a note at laughingheartsandminds@gmail.com. I see your Facebook page.